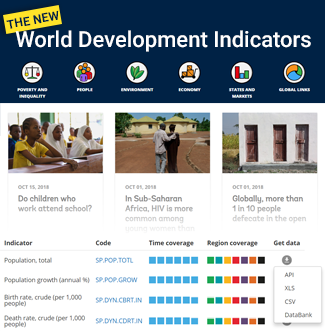 Provides a listing of available World Bank datasets, including databases, pre-formatted tables, reports, and other resources. An analysis and visualisation tool that contains collections of time series data on a variety of topics. Provides access to data collected through sample surveys of households, business establishments or other facilities. Explore raw data about the World Bank Group’s finances, including disbursements and management of global funds. Provides access to basic information on all of the World Bank's lending projects from 1947 to the present. Provides an understanding of Open Data and how to get “up to speed” in planning and implementing an open data program. Supports countries in conducting multi-topic household surveys to generate high-quality data, improve survey methods and build capacity.